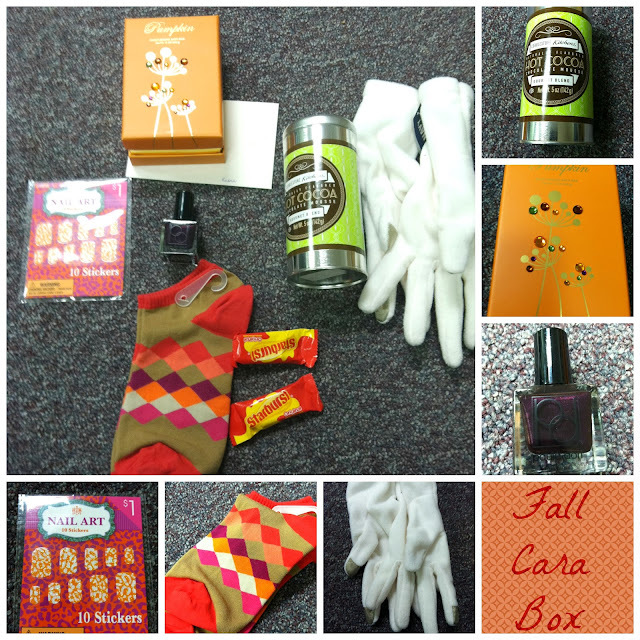 Back in August I participated in something called a Cara Box exchange. 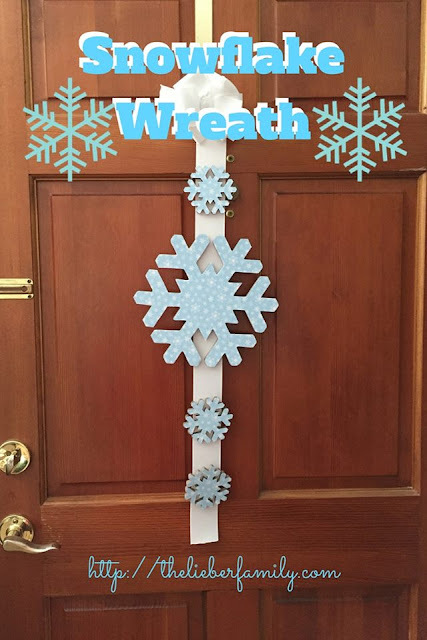 I had so much fun getting to know Erin and getting a box of goodies from her that I knew I wanted to play along again. 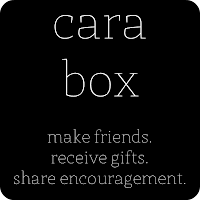 Kaitlyn just had her first baby and the Cara Box exchange has gotten quite popular, so she has moved it from once a month to once a season, which actually works out great for me! I have been able to spend more time getting to know Nicole and Sandi. I received my box from Sandi at the end of October and I was so excited to open it! I love getting things in the mail! Sandi sent me a lovely note as well as some awesome Fall socks, nail polish and nail stickers, gloves that I can wear and still use my phone (I have seriously wanted a pair of these FOREVER!! ), some hot cocoa and a pumpkin scented bath bar. I have already used the nail polish and it is a beautiful deep plum color. It's supposed to snow tomorrow (BOO!) so I may get a chance to try out the gloves too! If you want to see more Cara Boxes from other bloggers, Kaitlyn is hosting a link up on Nov. 18th. The new exchange opens on December 2 and is open until the 4th, so if you want in, jump on it.